Francesco Scaglioni has written on the mailing list, that he has discovered that Nik Player has put up invariant versions of the Adobe DCP profiles. You can debate whether invariant profiles are better or worse than unmodified Adobe profiles. But either way, it is always nice to have the option. 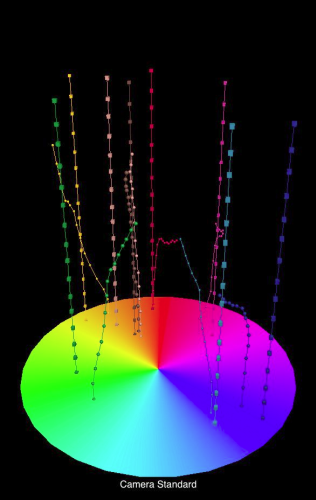 A colour profile visualized by Chromasoft. As it happens, this is also by far the easiest way to get hold of DCP profiles without a Windows or OSX installation. At the moment the most recent profiles can be found on this page on his blog. Unpack the the content of the archive to “(your home directory)/.rawstudio/profiles”. You will most likely have to create the “profiles” directory yourself. Real life experience by Thomas Lester: Invariate Adobe Camera Profiles. Nik Player: A rough comparison of Invariant Profiles. Is there a chance that the dcraw code will be updated to the latest version from the ufraw svn? I am still looking for rawstudio support for my camera (Z981) and my efforts so far to change-update to the new files are unsuccesful.